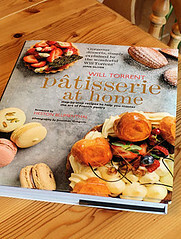 Just out this month is a fabulous baking book by rising pastry star, Will Torrent, called Pâtisserie at Home. An absolute treat for all keen home bakers, the book has 80 recipes with clear step-by-step instructions to make French pastries at home. You will find some timeless classics in the book (eg sachertorte, Black Forest gâteau), but also updated versions and some with a modern twist - the apple & Calvados crumble choux buns have an apple compote inside, Calvados cream and a crumble topping! 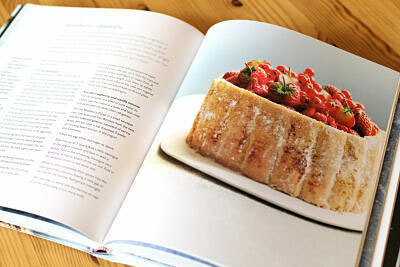 Not all the recipes are easy though, some are time consuming, and a couple of the recipes need special bakeware or ingredients if you want the finished dish to closely resemble that in the book. But having said that, all of the recipes look achievable to make in a home kitchen. One of the things I loved about the book, apart from the clear layout and print, was the photography by Jonathon Gregson. Each recipe is accompanied by a mouthwatering full page photo of the finished dish, and some of the recipes show more than one photo of the various steps (eg croissant pastry, macarons, salted caramel & chocolate tartlets). Another lovely addition is that most of the recipes have a little note in the description (and also at the end of the recipe) with different variations that can be applied to the pastries; the idea of replacing the tarte aux fraises to one with sliced mango and passion fruit is brilliant! The first chapter covers the basic techniques, including different types of pastry, crème pâtissière, frangipane and ganache. 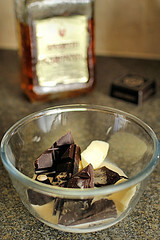 Also included are ideas for finishing touches, caramelized nuts and tempering chocolate. 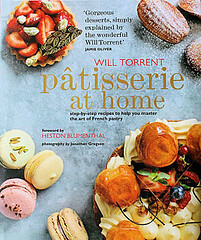 The other chapters are for: pâtisserie (eg mango & passionfruit mini éclairs, spiced rum babas); tarts (eg lemon & yuzu meringue tart, tart éxotique); petit fours (eg coffee & chocolate madelines, raspberry & vodka chocolate truffles); gâteaux and desserts (eg red berry charlotte, chilled lemon soufflés); and, lastly, bakery and viennoiserie (eg brioche, palmiers). 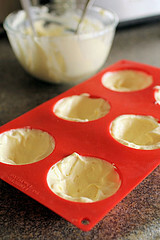 I tried out several recipes, the first one was for the white chocolate & almond meringue domes, page 39. You do need a 6-hole half-sphere silicone pan for this, which I do have and don't use often enough, although I think if you weren't too precious about the shape you could get away with using a muffin shaped silicone pan. 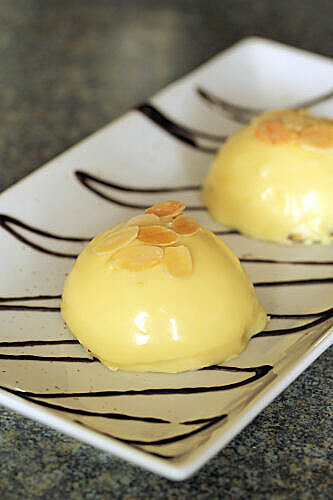 There are four components to the recipe, but not too difficult to make - it's basically an Amaretto ganache, covered in white chocolate mousse, which has a meringue disc on the bottom and then the whole thing is drenched in white chocolate ganache!! I had enough mixture left over to make 4 mini domes, which I thought were a better size, although some in my family preferred the sugar overdose that came with the larger ones. The second one was the florentines, page 88. 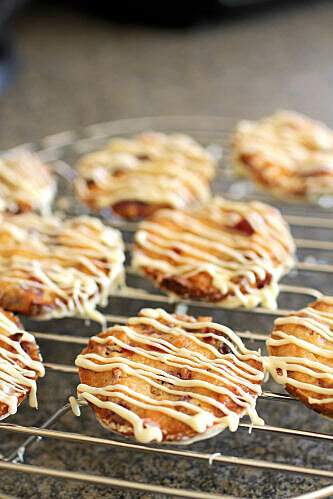 While I always follow the recipe quite closely when reviewing a cookbook, sometimes I have to substitute an ingredient along the way; in the case of the florentines it was cranberries instead of apricots, and white chocolate to decorate them instead of dark. I did have a slight issue with this recipe, which called for the mixture to be refrigerated overnight to set. When I followed the instructions to drop the mixture into the prepared muffin pans and flatten slightly, the mixture did not spread out when cooking, like florentine mixture normally does. My florentines were not cooked in the middle and were burnt around the edges. For the second batch, I warmed the mixture up a little and it spread properly in the pans, creating perfectly round florentines that were all the same in size and shape. I probably won't refrigerate the mixture next time, and am definitely going to make them again, maybe a Christmas version using dried cherries and pistachios. Usually my new books make their way to the bookcase overflow on the floor in the dining room after a couple of weeks, but this one will be given a special place on the little shelf in the kitchen that I save for my favourites. I want to try a couple of the chocolate truffle recipes and the one for the almond & honey friands, I can also hear the croissants recipe calling out to me! If you are quite confident with pastry you will enjoy the recipes in this book and be inspired to come up with your own versions of the pastries - and even if you are just starting out on your baking journey, you will find that you can master some of the less complex recipes with ease. 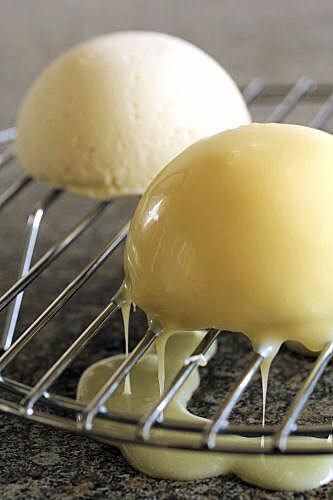 Recipe adapted from Pâtisserie at Home, by Will Torrent, published by Ryland Peters & Small. The original recipe used dried apricots instead of dried cranberries, dark chocolate instead of white chocolate and glacé ginger instead of crystallised ginger. I have put where you refrigerate the mixture overnight, but that didn't work for me - if it works for you I'd love to know. Melt the chocolate on low power in a microwave or in a heatproof bowl over a pan of simmering water (not letting the base of the bowl touch the water). 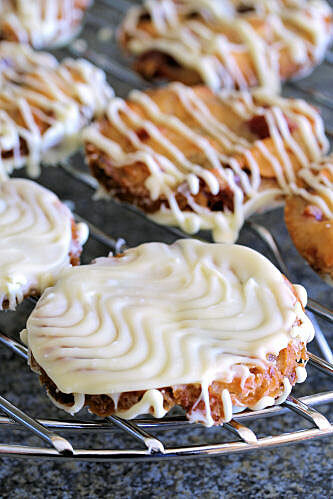 Put the chocolate into a small piping bag and drizzle over the florentines, or use a fork to flick the chocolate over them. 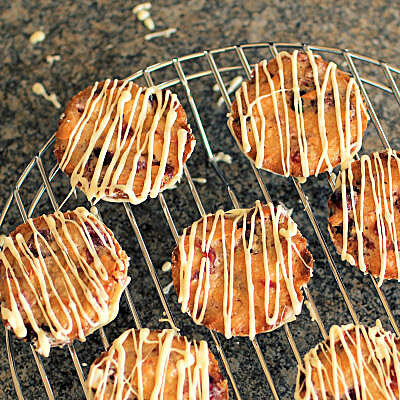 Naughty me, I gave the undersides a dunk in white chocolate too! This book can be bought from Ryland Peters & Small, Amazon and all good book shops. Disclaimer: I received a review copy of the cookbook from Ryland Peters & Small, but all views expressed above are my own. This content belongs to Nic at Cherrapeno. All writing and photography copyright N Fowers © 2007-2013 unless otherwise indicated. All rights reserved. 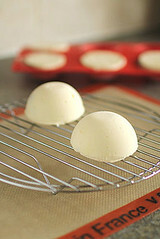 Wow those white chocolate domes look amazing when cut into. I love the look of this book was worried about how time consuming it was reflecting on how often I would use it. Might put it back on my Wishlist now..,,thank you for review! 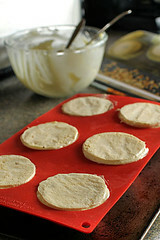 those domes look and sound so tasty, i'd be willing to go out and buy the special pan to make them! 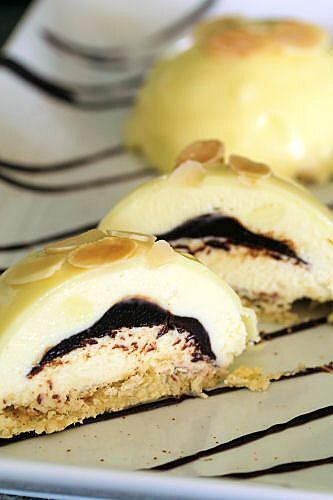 OMG those domes with the chocolate oozing all over them just look amazing!!! Beautiful pictures!